My gift was the Private Oasis at Half Moon Cay. The Carnival Liberty 5 day cruise, because it was the only ship going to Half Moon Cay. I had been to the Private Oasis in May on a Holland America ship. So it was fun to compare the differences in the two cruise line approach to very exclusive spot on Half Moon Cay. I am here to tell you Holland did it better, no surprise there. Having said that it was still great and worth the money if you have a group. The package included the services of a butler**, personal chef, bartender, cabana Steward, and lifeguard* along with the following: Whole fresh fruits, chips & salsa. Beverage package with Domestic and Imported beers; house pouring ‘wine by the glass’ (Red, White and White Zinfandel); Cocktails (Bahama Mama, Rum Punch, and Yellow Bird); frozen tropical classics (Pina Colada, Strawberry Daiquiri, Banana Colada, Margarita); mocktails (Virgin Pina Colada, Virgin Strawberry Daiquiri, Virgin Banana Colada). BBQ Lunch Buffet with selection of two salads, grilled hamburgers, hot dogs, fresh island fish, barbecued chicken, brownies and cookies. * No lifeguard ever showed up. ** Carnival provide a waiter, I would but have called her a Butler. HAL provided a Butler and it made the experience much better. The cruise was lots of fun with cocktails in our suite each night before dinner. 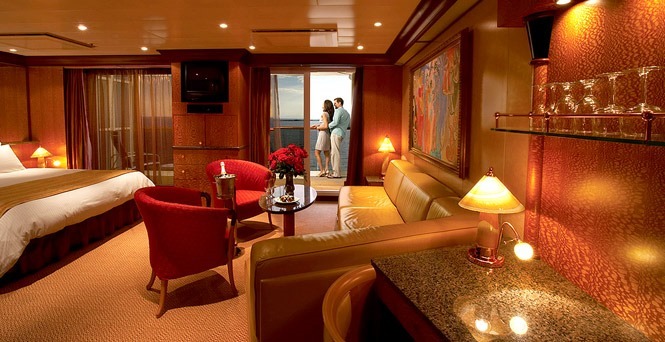 The suite was one of the Grand Suites, nice, but give me a Neptune Suite on Holland America anytime. This entry was posted in Birthdays, Entertainment, Family, Travel and tagged Birthday, Half Moon Cay. Bookmark the permalink.